Jeff and Steven McDonald were barely teenagers when they formed Redd Kross amidst the maelstrom of L.A.’s punk scene in the late 1970s. The band never found commercial success over several years and various lineups, but did build a cult following while influencing countless musicians before calling it quits. The brothers, along with former band members guitarist Robert Hecker and drummer Roy McDonalds, reunited in 2006, and the recently released Researching The Blues, their first CD of new material in 15 years, finds them sounding as potent as ever. The title track is a wild ride, bringing Jimi Hendrix style guitar playing into the realm of garage rock. “Stay Away From Downtown” and “Uglier” follow suit; creating a trio of hard-hitting songs to lead off Researching The Blues. Singer-guitarist Jeff McDonald’s raw vocals underscore the music’s cutting edge appeal. Things take a less manic tone from then on, as Redd Kross unveils a series of power pop gems with strong melodies and harmony vocals. “Meet Frankenstein” taps into the early Beatles, while “Choose To Play” and “One Of The Good Ones” feel more contemporary. 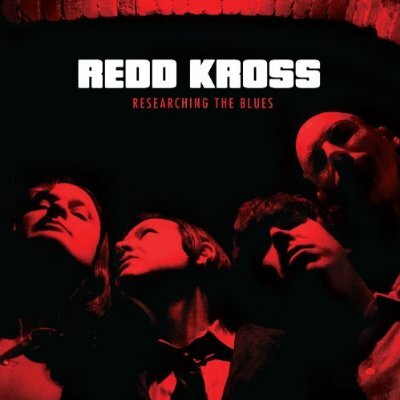 The fun and off-kilter “Hazel Eyes” adds to the already impressive Redd Kross repertoire.